Marcus Dinanga proved to be a revelation after signing on loan from Burton Albion. Matlock Town joint-manager Craig Hopkins says he’s keen to explore the possibility of bringing in another striker on loan next season to help boost their attacking options. Burton Albion star Marcus Dinanga proved one of the finds of the last campaign as he scored 34 goals and helped the Gladiators to a ninth-place finish, just six points outside the play-off places. And Hopkins is hopeful he and Glenn Kirkwood can find another gem at a higher level club that could aid their cause. He said: “Marcus was a great example of how the loan system can work in your favour if you find the right player and I think it’s something we have to look at again. “We have plenty of match-winners in the squad already but sometimes if you can find someone like that and who can give you that extra bit of pace and energy it can work wonders. Hopkins and Kirkwood look set to tie up deals with all of last season’s players when they return for pre-season training next week, all having agreed to stay on for another season at least. But Hopkins also wants to bring in some fresh faces that could make the difference between Matlock being play-off hopefuls and genuine promotion contenders. He said: “You always need some fresh faces I think, just to give the team that lift and to freshen things up. “We did so well last year and if we can just find that bit extra then who knows what we might achieve. “We have a very young squad with the exception of players like Phil Barnes, Marc Newsham and Adam Yates who are that bit more experienced. Young players improve year-on-year anyway by and large so by virtue of that alone the squad will be stronger. Hopkins says he is confident the Gladiators squad will return from their pre-season break in good shape and with their batteries fully recharged after a long season that saw them play 64 matches. 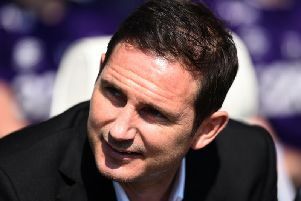 He added: “We told them to go away, relax and to forget about football for a few weeks but then to think about building their fitness levels up ahead of the return to training. “That will mean we can hit the ground running once they return and not have to worry too much about the fitness levels. They’re a disciplined bunch so I don’t have too many worries that they’ll get too out of shape in the time they have off. Hopkins added that some trialists will be amongst those who being pre-season training on Saturday, June 24, and that no more friendly matches are expected to be scheduled with nine already in place, including five home games against Football League sides, beginning with Chesterfield on July 6.